It has now been a few weeks since we closed out our Winter 2015 auction. The stellar results on banknotes, coins, art glass, and signs has had us very busy accepting new consignments for the Summer 2015 auction taking place on July 11th. The items below weren’t the most expensive lots in the sale, but these were perhaps the most surprising. 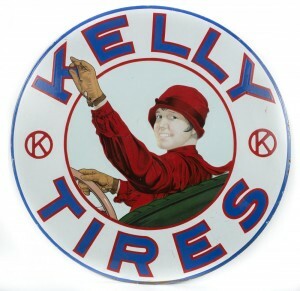 The Kelly Tires sign that we had estimated at $30,000 to $40,000 sold for $87,750 including the buyer’s premium. We believe that is a new record for a porcelain sign at auction. 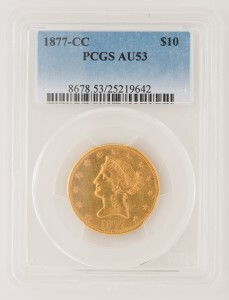 Another big surprise was the 1877 Carson City $10 gold piece that we auctioned. It had a pre-auction estimate of $12,000 – $18,000 and it ended up bringing $39,780. The banknote section saw several realized prices in excess of $10,000. However, I believe the most hotly contested note was a 1902 $20 blue seal from Daytona, Florida. There were at least five different bidders participating at over $10,000 and it sold for $19,890 against a high estimate of $15,000. We are currently accepting consignments for our Summer 2015 auction. The consignment deadline is a firm May 20th, so if you are thinking of consigning please contact us soon.